The construction of Brown Stone Courtyard has ended in a scandal. 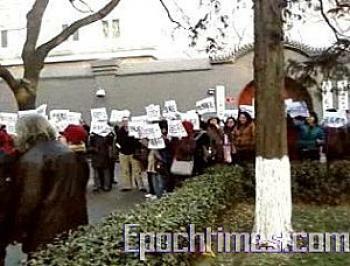 Over 120 victimized home buyers, most of them university faculty and staff, protested in front of the Beijing Municipal Government office on January 4, 2009. Brown Stone Courtyard was a housing project developed by the Beijing Taiyue Real Estate Development Company (Topeak.com.cn). The location of the Courtyard is east of the Yuanmingyuan Park between the Tsinghua University and the Beijing Sport University. The real estate developer, Liu Jun was arrested for bribing the former head of the Haidian District, Zhou Liangluo, who later was sentenced to death. The financial backer of the project is broke and the construction unfinished. The home buyers are mostly faculty and staff from Tsinghua University, Beijing University, Beihang University, China Agricultural University, and the Beijing Forestry University. Some of them work in Zhongguan Village, including director Ma Rao of the China Films Group and Zhou Yijun, a host of China Beijing TV. 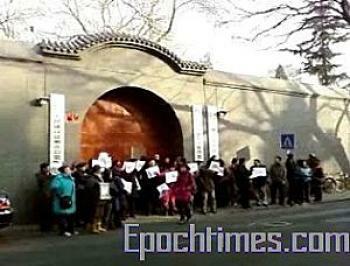 It is said the officials from the Beijing Appeal Office treated the protestors rudely. The reporter called a professor for an interview but was turned down. It is learned that during the New Year, these home buyers received a warning asking them not to create any chaos or sabotage social stability. Since May 7, 2008, the buyers have protested over 20 times to different offices. Their problem remains unresolved.